Traveling is so much more pleasant when you’re wearing comfortable clothes. But you don’t want to go to the airport looking like a slug… So you want your travel outfit to be both comfortable and stylish. But how do you put together a simple outfit that is both comfortable, and stylish enough to make you feel “ok”..? 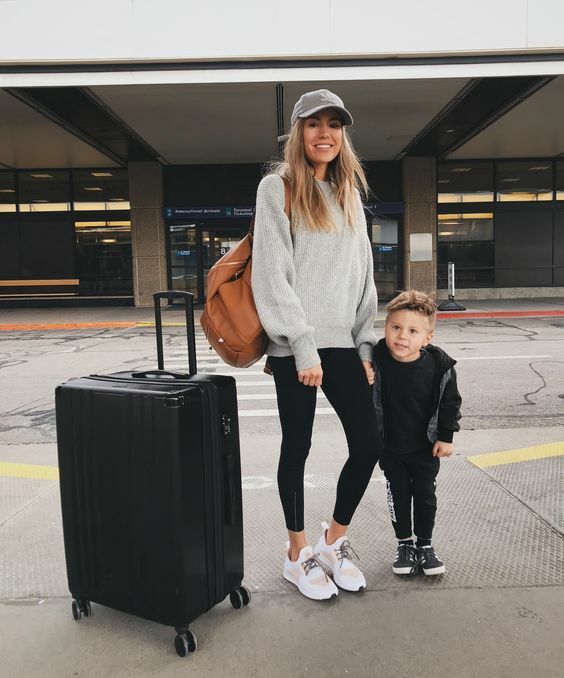 Most people struggle with this and finding a good travel outfit is a never-ending struggle… That’s why I’m now sharing this “style inspo: travel outfits” -post, to share some inspo on what you could wear when traveling! My own to-go-to piece of clothing when it comes to traveling is leggings. I always wear leggings when I travel! Black leggings from either Victorias Secret or Nike. Leggings are simple, comfortable and look stylish when paired the right way. Leggings are also great because they suit both cold and warm weathers. Sure, they might be cold af it you land in a Winter destination, and warm af if you land in a tropical destination – but you get away with it and they look good either way, + can be styled in so many ways to suit the weather (f.ex. with a t-shirt in warmer destinations, or with 2 knitted sweaters and a big & cozy Winter jacket in colder destinations). My second to-go-to piece of clothing for traveling is the cozy sweater, hoodie or t-shirt. Lately I’ve really been into long, knitted sweaters but I do sport a hoodie from time to time. Since I’m the always-freezing type of person, I usually wear one of the long-sleeved pieces when I go to the airport and also have it on during the flight. But I always keep a t-shirt (preferably a longer version) in my hand luggage so that I’ll be able to quickly change into it if I’m landing in a warm destination. And of course, if I’m traveling in the Winter season I always wear a cozy jacket or coat over the long-sleeved hoodie or sweater. But then what about shoes? I always wear sneakers, white Converse all stars or white Nike’s. Sneakers are comfortable to walk in and are also easy to kick off when you’re inside the plane. Plus they also stretch a bit if you’re fit are two swollen balloons when you land (mine usually are, it’s horrible). Lastly, there’s a few must-have accessories that I always have with me (or am wearing) when I travel. Seriously, they’re a must! And these are of course the sunglasses (I actually wear these on the plane when flying daytime, it’s usually so light inside the cabin! ), a scarf (to keep me warm if it get’s cold), a hat of some sort (either my black LA Dodgers cap or my Borsalino fedora, depending on the destination) and a cute little bag of some sort (I usually have a little black leather backpack that I adore). Of course, we all have our own styles, and maybe you don’t like the styles I’ve shared here in this post. But then I’m seriously curious to hear about your to-go-to travel outfit, what do you always wear when you’re traveling? Psst, all images in this post were found via Pinterest. I always look to Sincerly Jules for travel inspo!